I’d really love your help to demonstrate the importance of personal learning networks so I’m hoping you will help me with my presentation by sharing your thoughts. I’m doing a presentation for Educational Computing Association of Western Australia (ECAWA) State Conference next Friday to overview the ways educators can use online tools to forge personal learning networks related to our areas of interest. Time is limited and I’ve only 30 minutes to talk on the topic. During the presentation I’m planning to share this post to show how web tools can extend our learning and reflection beyond what is normally achieved during traditional professional development and enables us to share our learning with global educators. What do you think are the 3 most important aspects on personal learning networks I should cover? Why is your personal learning network important to you? Which tools are the most important part of your personal learning network, and why? Can you provide examples of how your personal learning network has enhanced student learning within your classroom? Your tips for educators on how to get started setting up their own Personal learning network. If you are based in Western Australia and interested in networking with other educators interested in ICT in the classrooms – please join us at the ECAWA conference next Thursday July 17 and Friday July 18, 2008. 1. My name is Erin Freeman and I live just out of Christchurch, New Zealand. I blog at http://m3teacher.blogspot.com and class blog at http://m3rbs.21classes.com. 2. Finding teaching resources, building relationships with like-minded professionals and receiving tech and teaching help almost immediately when requested. 3.I use Twitter, Diigo, Classroom 2.0 ning, facebook, oznz educators. These have been paramount in my development and understanding of teaching web2.0 skills. I have especially enjoyed developing a support network of professionals who are interested in teaching and learning. 4. I have used it to drum up comments on kids blogs. Mostly it allows me to find valuable and practical teaching resources. 5. Join Twitter and Diigo and start a blog! 1. My name is Danny Nicholson and I live in Southend, Essex, United Kingdom. I blog at http://www.whiteboardblog.co.uk I am a freelance teacher educator. 3. I use twitter in the main, delicious and diigo – all good for finding out about new websites that may be useful in the classroom. I also use some of the ning classrooms and some online forums. 4. I have lost count of the number of good resources and ideas for teaching that I have found via these groups. I share them with my students via a blog I have set up for them and use many in my training sessions. 5. Join Twitter. Follow a few people on here who are commenting. See who they follow/reply and talk to and follow them too. Join Diigo and do likewise… then get talking! Good Luck! My name is Skip Zalneraitis. I live in Brattleboro, Vermont USA and teach across the river in the high school in Hinsdale, New Hampshire. I come late to teaching (3rd career) and to teach in a poor community with few resources. I came to this career and knew in choosing teaching that I needed to upgrade/update. I completed an online M.S. in Education at Walden University. I love technology, personally and professionally. I knew things couldn’t end with the M.S.. I continue these inexpensive classes at ed2go.com that are six weeks and twelve sessions long. They have been very helpful. I continued to cast around until Edublogs found me – http://skipz.edublogs.org . From there I found Twitter, del.icio.us, and now Diigo. Twitter is absolutely critical not only for the posts, but for the blogs and websites of the community members. Once I began aggregating these blogs in GoogleReader I had a core for a PLN. It’s hardly a one-size-fits-all strategy , but it is working for me. (d) start your own blog! 2. Most important aspect (for me): The web is ‘always on’ and is not limited by place and time. The conversation is whatever, whenever, and wherever I am willing to participate. 3. My tools: I use my RSS reader, Twitter, del.icio.us, and friendfeed daily. It’s important for me to be connected to other professionals and gain from their collective wisdom. We share teaching ideas, strategies, tools, and resources, to name a few. network is always on 24/7/365 and always willing to share ideas, offer help, it is way to build relationship otherwise not possible. 3. My network is important because it is my connection to the world. The tools I use most are Twitter, Skype, del.icio.us, Diigo, Classroom 2.0, Google Reader. 4. I share the resources/tools I have found through the network with the teachers I work with both for their own personal learning, as well as with students in classrooms. 5. Ask others for blogs they read, set up a reader, join Classroom 2.0, get a Twitter account, see where they take you. Lurk for awhile if you are unsure what it is like to be involved in online networks, before you jump in, but definitely don’t by shy, come learn and contribute with us! 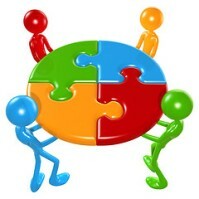 The 3 most important aspects of a PLN is the importance of a PLN, the connectedness with others, and hwo to develop a PLN. My PLN is important because I felt isolated from the educational community and I had to take an active step to stay connected. I want to know the current topics and trends in my field as well as new technology involved. Blogging and Twitter has been instrumental in helping me with this connection. Through blogs and twitter, I have found live workshops to attend as well as recorded ustream workshops that have been so informative. I have given workshops showing tools that will help teachers in the classroom. Some teachers do not have the time to explore and experiment with these tools and since I could, it was exciting to share it with others. I love to hear when ateacher has used a tool I recommended in the classroom and how successful it was. My suggestions would be to start reading blogs and join twitter. In twitter, follow people who have education in their profile and follow the conversations. I would emphasize the that getting connected will increase your learning exponentially! I started using blogs, Google Reader, and twitter about six months ago, and it totally increased my learning that even surpasses what I learned during my M.Ed. My RSS reader, Twitter, and Diigo are the two tools that keep me the most current. It is amazing how busy I am but still can find a few minutes each day to check what is new. It is amazing how much you learn, how passionate you become about sharing with others, and wanting to help bring others along as well. Using my PLN helped me to join with other teachers from across my state to complete a collaborative project. I read a Twitter from a fellow ITRT from the other side of Virginia. I checked out the Voice Thread link that she had posted. It was a project I knew my teachers and students could use to their benefit. I contacted the teacher and our students were able to collaborate together to increase learning. From the first contact to the end of the project was a span of five days! Now I have a contact for future collaborations. To get started I would start reading other blogs. READ. READ. READ. That will get your juices going and before you know it you will get to blogging. I would also suggest getting hooked in with Twitter and follow the folks that write the blogs you read, and connect to those who have similar interests as you do! I think it is important to learn how to build a PLE, make connections and “keep them alive”. I learn every day new things, educate and discipline myself, preparing to be a better teacher. I rely especially on del.icio.us, RSS, Twitter and Cirip (the Romanian microblogging platform), Ning and edu-blogs. The RSS is essential. Lots of educators don’t understand what is good for. Then social bookmarkign and social networking (started with Ning and ending with microblogging). Hi Sue, sorry I haven;t got time to go into too much detail, but here are a couple of my posts where I talk about my PLE. My name is Barbara Reid from Hamilton, New Zealand. I am an ICT Facilitator and my role is to work with teachers to support change as they integrate technology into classroom practice. For me, my PLN is about sharing – sharing knowledge and practice. I have learned more through twitter since i joined than I could have learned anywhere else. A PLN allows you to be a self directed leaner. It’s a place to go when I need help / support / direction. I use twitter, diigo, del.icio.us and facebook, as well as some nings. I also encourage teachers to set up blogs and wikis in their classrooms. I use del.icio.us and diigo in the classroom as a way of sharing resources with teachers and students. Wikis and blogs are great for professional development within our learning community and also as a teaching tool. Blogs provide authentic audiences for writing and allow writers and readers to have conversations. 1. Hello, I’m Kimberly McCollum and I’m a PhD student/graduate instructor currently living in Virginia, USA. My blog is http://kamccollum.wordpress.com. 2. I think the three most important aspects of a PLN are people, tools, and resources. 3. My PLN is important to me because it is a connection to a larger community and a great way to learn quickly. The most important tools in my network are Google (iGoogle, Google Reader, Google Alerts, Google Scholar, etc. ), WordPress, and Diigo. The various Google tools that I use serve to filter the information that I receive and make it manageable. WordPress gives me a venue to synthesize my thinking and get feedback from others. Diigo helps me keep organize everything I find. 4. My students are pre-service teachers and my PLN has made me aware of the many Web 2.0 technologies available to classroom teachers. I wouldn’t be able to share these possibilities with my students if I hadn’t taken the time to develop a PLN. 5. I’m not sure if my way will work for others, but I started by setting up an RSS reader with just one edtech blogs. I used Google and Wikipedia to track down meanings for unfamiliar terms and followed links in posts. As I read, I added the blogs that I found interesting to my reader. When I felt comfortable (or at least when I stopped feeling scared), I started experimenting with the tools that heard people talking about in blogs and began to speak up in conversations. I have a blog http://www.technologytwitter.typepad.com, which is where I post personal thoughts and posts which express my views. I also have http://www.technologytwitter.typepad.com/westcoasttafe, where I post information to support teachers working with ed tech at my TAFE. I keep them separate and pay for my blog myself to maintain independence. 1. That everyone is different and everyone’s network is different, it’s about having the confidence to follow and develop your own interests. 2. Never be afraid of asking dumb questions – we’ve all been there! 3. It takes time to grow a network, it’s like moving to a new town – You can’t expect to feel integrated immediately, but participate, contribute and you will settle and find what you are looking for. 3. Why is your personal learning network important to you? Which tools are the most important part of your personal learning network, and why? It’s vital to me. The things I need to learn are random, they are not provided by ‘courses’ and I need to learn them ‘in the moment’. i.e. midnight, 5 am, urgently before a presentation. My network provides me with support and answers. In addition, my network allows me to challenge concepts, gain experience, and gain advice from others. It’s like canning wisdom. Snag It, Skitch, Twitter, Plurk, Google: docs, mail, calendar, reader and sites, Ning, RSS and Slideshare. I particularly love the presentation feature on Google docs that allows you to present a powerpoint and live chat about that powerpoint simultaneously just by sharing a URL. 4. Can you provide examples of how your personal learning network has enhanced student learning within your classroom? I can’t personally as I’m involved in implementing strategic change in the area of ed tech and supporting teachers…..
5. Your tips for educators on how to get started setting up their own Personal learning network. Hold your nose, take a deep breath, and join Twitter. From here things will develop for you. Twitter acts as a hub. 1. My name is Ann Oro. I teach computer class for 5-14 year old students at a private school in New Jersey in the United States. My website that acts as a hub is http://www.mrsoro.com. 2. Three important aspects of plns that you should cover are are: expanding knowledge beyond one classroom to others in your country and the world; saving time when you have a problem because your pln can offer many suggestions; connecting your students with projects that you couldn’t do before due to lack of partners or knowledge of the possibilities. 3. My pln is important to me for the three reasons I listed above. I primarily use microblogs like Twitter, read and respond to blogs, participate in the forums on the classroom20 website, attend training sessions shared around the globe, and listen to podcasts. 4. My eleven year old students in math class discussed solutions to calculation and measurement problems with a class in Canada. My seven and eight year old students in computer class drew and wrote descriptions with a class in Florida and then reflected on their work. Both of these projects enhanced their learning by allowing them to work at a different cognitive level than I had in previous years. 5. I started by listening to and chatting at the Women of the Web 2.0 webcast. I first read, and eventually read and responded, to blogs. As I got to know more people, I began chatting on Twitter. The Twitter service has been my primary source of getting to know and work with other teachers. 1 – Point don’t poke. 2 – Regular e-contact, daily if necessary – certainly more than once weekly. 3 – Lashings of helpful praise and helpful tips – distance learners thrive on attention. The networks I’ve used were important to me as it gave me a direct way of getting to know students that I never met, or even spoke with on the phone – many were overseas. I don’t have a classroom, so that made the network even more precious to me. The network was mainly one to many, with me being the one, though there were occasions when I used a collaborative approach to projects. But the enhancement came through the use of the Internet with these students who, hitherto, had worked from write-on booklets that they returned to me to assess. Interactive learning resources like the ones on my RLO post were a real hit – I got !!wow!! success from all my students without exception – I’ve got the statistics to prove it too. I’m not hot on tips, as I still see myself as a learner in using networks. BUT lashings of feedback and praise seem to go a long way with all distance students. I use these a lot. My web site was my pad and still is. Good luck with your presentation Sue! 1. I am Simon Brown in Brisbane, and I use http://cafechat.wordpress.com to blog my ed-tech experiences. c.	Skill building among network members. 4. Members of my PLN have shared examples of their achievements, encouraging me to try using online social networking tools with my students. My students have benefited by building their own community, and their own knowledge, at http://stomas.ning.com/. Additionally, I use http://stonemasonry.wikispaces.com/ to connect my industry network. 5. A Personal Learning Network begins with a Gmail account- use this address to start other free accounts, and to receive notifications of comments by others on your work. Build your own knowledge by connecting with other practitioners to share what you are doing. You have a wealth of information already to sift through. My contribution is to send you the following links. Amazing results due to my colleague’s use of technology in the classroom. I can provide you with a short video example if you wish. It’s all simple and inexpensive. Just get back to me. All the best and good luck with the presentation. I think it has all been said! One important addition I would like to make is that teachers used to work in isolation (and some may still do). Now, there is so much sharing and advice available that I think teachers feel more supported and help each other to stay sane(!). 1. people are social by nature, by sharing, far more enthusiasm and motivation is generated than by working in isolation. 2. learning from what others do is very powerful. 3. knowing there is someone out there who can help with whatever problem/situation you have/need help with. Good luck with your presentation! Hope we get to see/hear it. My name is Elaine Talbert, Sydney, Australia. I have a blog, it’s not very well developed. Over the last year I have invested a lot of time into researching learning 2.0 tools. Late last year, I put together a mini-paper about my personal, professional learning journey. I would be happy to mail it to you, since I can’t attach here. I also submitted my Top Ten tools for Jane Hart’s website. My journey continues lately with Twitter. I am finally a fan. Plurk, maybe? I am a school principal now in IT. I share all my learnings with anyone who is looking for opportunities to enhance their learning and teaching . As an early adopter, I was able to show teachers the potential of technology tools to improve learning. The late majority still need some convincing and a lot of PL. This was a timely request for me as I am getting graduate credit from the K12Online Conference 2007, and one of my reflections was on the keynote speech given by Derek Wenmouth on Personal Learning Networks. I posted this on my blog and here, so thanks for giving me the opportunity to reflect in this way! I hope your presentation goes well. Twitter as an educational tool. I think it’s important, but it often feels awkward to me. Developing my personal learning network is important to me because I learn so much from others by doing so. I find it exciting to know that I can connect with educators around the world to better my own teaching in my little part of the world! This is an amazing worldwide community! Last school year, when I was learning about so many tools and websites, it was fun to introduce them to my students as it often captured their attention in positive ways. This coming school year I look forward to connecting my students with others by creating a class blog that will be tied to a reading incentive program that we have done for many years. I am sure it will enhance and enrich that project. One tip: Choose a reasonable user name that won’t haunt you later, and use the same user name, password and email account for all of the great resources that you will be joining in the near future! Sue, my name is Dean Groom and I’m IT teacher/co-ordinator. I would suggest looking at a blog – and asking if the info they are seeing would be of value, and get them to make up an ‘I like’ list of things – perhaps http://heyjude.wordpress.com. Then ask if they have any ‘I wonders’ – as in things that they didn’t see and might like to have seen. The flick to some of Judy’s blogroll, to see if they can find some ‘I wonders’ on other blogs. This is a practical demo of how a PLN works. Ultimately if they don’t have a need to create one, then they won’t. So if this is the first exposure to it, then try and externalize the benefits. I personally think that 90% of teachers genuinely feel like they are doing ‘okay’. But if you pick up 5% of the audience along they way, then you’re doing par for the course. You know what you’re doing! you are UBER user. Hi Everyone – thanks so much for all your tips and advice. Sorry for my slow response in thanking you but came down with bad cold (cough) and oldest son (accident prone) broke his hand on Sunday. Just wanted to let you know where I am at with the presentation and how I am using the information you supplied. What I wanted to do was modeled how a PLN works in action plus show how collaboration leads to greater innovation. I will be started my presentation with background on how I got involved with everything I do. Then I have used your information to prepare the remaining slides. 1) I grabbed your locations and inserted them all onto a World Map. 3) Created a visualization of most important PLN tools based on which ones you used. I did this by adding together how many of you recommended which tools. 4) Also created a list of getting started tips based on listing and then counting your suggestions. Wow, you’re well organised! Thanks for all the links to the data – looks good from New Zealand! Upon reading this request, I couldnt help but reflect back on a day in mid January this year, when I tried to make sense of twitter. Sue, you jump started me and made me part of your network and then part of a wonderful global network that has been vital to my uptake of web2.0 tools. I have answered your questions in a post at http://murcha.wordpress.com/2008/07/16/the-vital-importance-of-personal-networks/ as it is too lengthy to place here. – My name is Ines Pinto, I’m a teacher of Portuguese in Cascais, Portugal; my students are 10 t0 12 years old. – My PLN happens to be vital to me, as it is a sort of “home” to learn, to share, and, above all, to build a sense of community that goes beyond any boundaries. – My adventure in applying web2.0 in the context of the classroom has just begin in May, after the discovery of Twitter, when I started to blog in http://stora.edublogs.org at the Edublogs Community in order to participate in a Comment Challenge. During this challenge, a totally new world openned to me. – Now I use also Diigo and Delicious to organize and share information; with my young students, we worked in a Wiki during this school year and in the Moodle platform embedded in my school site. To follow some special blogs I use RSS and Google Reader. – I noticed a great enthusiasm in my students for all the activities we did on line; they surely read and wrote more than before, they hopefully feel more open to each other in this sharing and collaborative approach of learning. – When they left for holydays, they said to be looking forward to communicating with foreign students we’ve found all around the world. – As a tip for those who will start this endless quest soon, I’would tell them to read the splendid advices listed above – from previous comments. I would also like to tell them to take their time to study, internalize and apply the wonderful lessons they will be offered by their new friends. As I’ve been told my self in my first days: “You must listen to the wisdom of the network”. This is after the fact (and I can tell that your presentation was dynamite), but your questions about how we build our online connections were good to reflect on. I blogged about my PLN here. I love Ines’ comment above: “You must listen to the wisdom of the network”. This creates a culture of respect. @Jan Thanks – actually it wasn’t after the fact (the night before I think). I also loved Ines quote and used it as the title of my presentation. Thanks for sharing your PLN with us. Pingback: Bag o’ Tech » Building Personal Learning Networks! Hi all. Silent gratitude isn’t much use to anyone. Thank you so much for your future answers :-D. Karen.